All models use a jack instruction and a jack stowage decal located on the underside of the trunklid. And if equipped, an Anti-Spin decal. 64 Jack instruction. All models. 64 Jack stowage. All models. 65 Jack instruction. All models. 65 Jack stowage. All models. 66 Jack instruction. All models. 66-67 Jack stowage. All models. 67 Jack instruction. All models. 68 Jack instruction. All models. 68 Jack stowage. All hardtops. 69 Jack instruction. All models. 69-72 Jack stowage. All models with Super Stock wheels (SSI is depicted on the sticker, but this sticker was used for all SSI, SSII and SSIII wheels). 69-72 Jack stowage. All models with standard wheels. 70 Jack instruction. All models. 71 Jack instruction. All models. 72 Jack instruction. All models. 73 Jack instruction. All models. 74 Jack instruction. All models. 75 Jack instruction. All models. 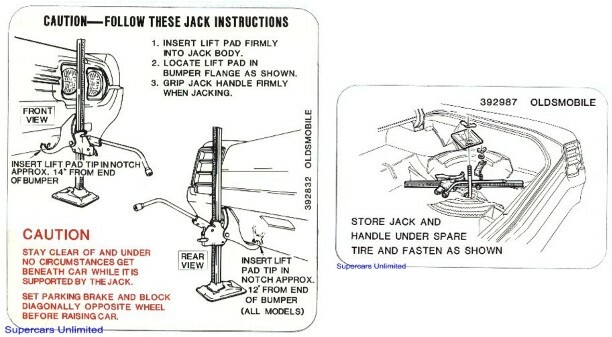 76-77 Jack instruction. All models. 73-75 Jack stowage. All models. Located on jack cradle. All 64-75 models. 64-72 Anti-spin warning (all with "posi"). Oldsmobile Cutlass and Olds 442 trunk compartment stickers decals.